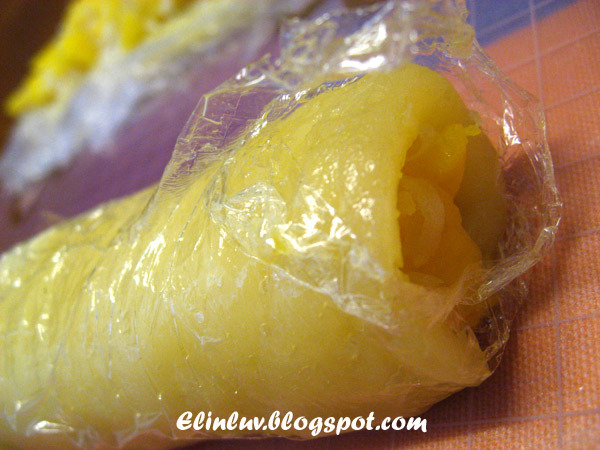 Elinluv's Tidbits Corner: My Close Brush With Mango Glutinous Rice Rolls ! 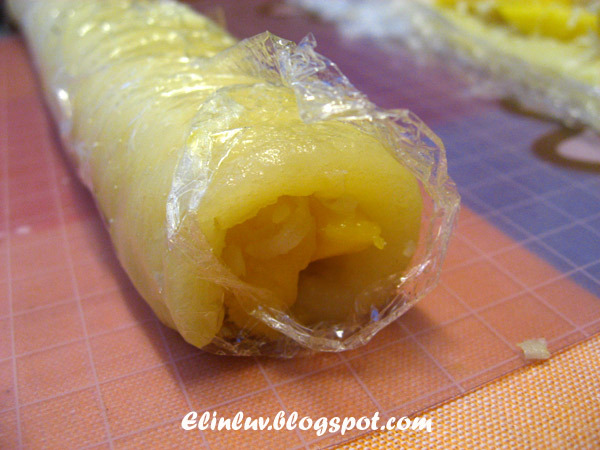 I put together the cooked gelatin cheese fillings and the 'no change steamed flour ' together and added some water to make the mixture of thick flowing consistency and steamed again into mochi textured dough. I will not make this again for sure. If you have the same book that I have , please take note of this recipe. My modification has turned this roll into a nyonya kuih instead. It was not too bad , tasted quite okay though but not the ideal kind of dessert that I expected from the magazine A word to the editor of this Pop Club Magazine, please do a proper job before printing out the recipe. Wasted my time and energy ! this roll after my modification has a slight soft chewy texture..
close encounter with a recipe that fails. Well, they still turned out good...and that's all it counts. I disagree with Angie's Recipes's comment. A recipe that still turned out good if you follow it to the T is fine but a recipe that turns out alright after lots of modifications is not all that counts. I believe all editors and cookbook authors should triple test their recipes properly prior going to print. If I were you Elin, I'd file a complain and write a letter to the editor. Actually, I've had similar situations ... a lot ... I know it ain't a pleasant thing to go through ... You feel like you've been cheated, sort of. This looks very Thai food! 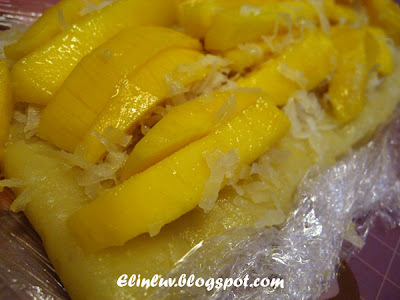 I like mango very much, this will suit my appetite. 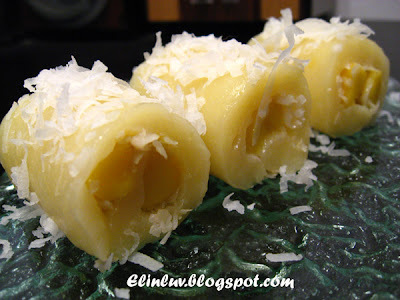 I have the same experience like you when I followed to recipe in magazine or newspaper, usually with failed result. I never trust a recipe in a magazine anymore. 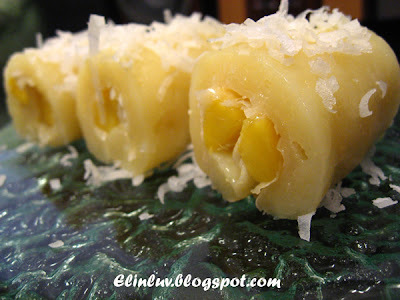 I feel recipes that share in blog are better and can be trust!! First of all, excellent save! But I'm sorry that the final outcome wasn't what you expected when starting. It does make you wonder if the editorial staff actually made the recipe as written or were simply handed the instructions and just printed it. To be fair, perhaps there was a printing error? In any event, it does take experience and skill to be able to salvage it and you certainly did an excellent job! This kuih looks good to me in any case. Speaking about last minute modifications, it just happed to me last Thurs. I had intended to make a velvet chocolate cake but after measuring out all the ingredients and just started to cream the butter, heck I forgot to buy sour cream. I quickly had to search out another cake recipe and re-measured the ingredients again. Luckily I was able to salvage what I had started. Hi Jo...wo..you are better than me...at least you are still on the right track.